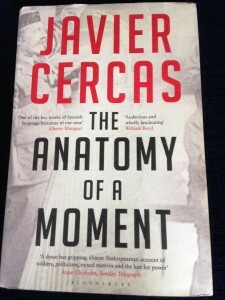 The Anatomy of a Moment: Javier Cercas. I’ve not posted for a while, having been preoccupied with reading Leon Edel’s brilliant multi-volume Life of Henry James, (I’m intending writing more pieces on The Master’s stories) and rereading Roberto Bolaño’s 2666 – another weighty tome – in order to contribute (fitfully) to the lively discussion about this novel going on over at The Mookse and the Gripes website. Meantime here’s note about something I read earlier this year, and wanted to recommend. I reviewed Soldiers of Salamis by Javier Cercas here back in February, and found it similar in approach, in some ways, to W.G. Sebald’s, with its factual-documentary approach to real historical events, narrated with all the imaginative brio of a novel. In The Anatomy of a Moment Cercas has produced an extended piece of reportage, but once again it’s an exhilarating reading experience. In meticulous detail – I must admit I skipped some of the more arcane background detail – he reconstructs the events in the Chamber of Deputies – the Spanish parliament or Cortes in Madrid – during the investiture vote for Calvo Sotelo, the new prime minister, to replace Adolfo Suárez, on 23 February 1981. Suárez had presided for nearly five years, supervising the transition from the dictatorship of Franco as Spain edged nervously back towards democracy, with a precariously restored king Juan Carlos. What happened next, at 6:23 pm, was broadcast on television – that ‘fabricator of unreality’ as Cercas calls it – around the world next day: Lieutentant Colonel Antonio Tejero, uniformed, brandishing a gun and wearing his shiny tricorne hat, entered the Chamber accompanied by members of his Civil Guard, armed with automatic weapons. Several volleys were fired into the ceiling. 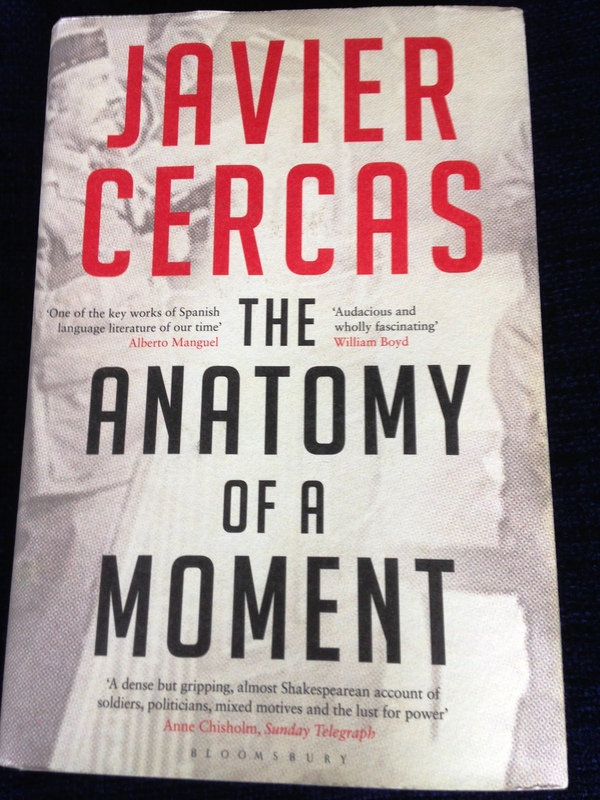 Cercas reconstructs this first dramatic ‘gesture’ with chilling authenticity: democracy seemed about to be still-born. A coup d’état, a ‘golpe de estado’ seemed to be taking place. For the Spaniards who watched the footage this was their Dallas 1963 moment. Cercas structures the mass of material into five sections, with the focus on the three courageous ‘gestures’ of the three members of the Cortes who refused to comply with the trigger-happy golpistas’ shouted commands to lie down on the floor and do as they were told. These three were Suárez himself, Gutiérrez Mellado, a former Francoist general who had in recent years changed political direction and served the nascent democracy, and Santiago Carillo, who led the recently legalised Communist Party. Mellado and Carillo had been bitter enemies, on opposite sides as a consequence of the terrible Civil War forty years earlier. Their gesture of defiance united them. The future of Spain’s democracy hung in the balance. The golpistas held their victims hostage for eighteen hours before surrendering. The tv footage was released next day. Although it only lasted some thirty minutes, its consequence was extraordinary. I lived in San Sebastián in the Basque country a decade after these events. (At the time of the golpe the increasingly violent Basque independence struggle led by ETA was causing consternation in the Cortes and internationally; there were accusations of torture of suspected ETA prisoners by the Spanish authorities, and the political situation was close to boiling over.) Friends there told me that many of their families, on seeing the film of Tejero and his Civil Guards’ storming of the Cortes, loaded their cars and fled across the border into France a few kilometres away. The older ones who remembered the Civil War and most of those who’d experienced the loathed dictatorship ‘cuando Franco’ believed fascism was returning – and again the Basque people and its culture would be oppressed. Incapable of inventing what I know about 23 February, illuminating its reality with fiction, I have resigned myself to telling it. The pages that follow aim to endow this failure with a certain dignity. He succeeds for the most part. It will not, he says, ‘entirely renounce being read as a history book’; it’s ‘not a novel’, but it ‘won’t entirely renounce being read as a novel’. It is delineated with some of the ‘symmetries of fiction’, he says later. You don’t have to be interested in the baroque intricacies of Spanish politics to enjoy The Anatomy of a Moment; anyone who cares for and believes in the human struggle against the agencies of oppression will find it salutary. Text used: Bloomsbury hardback edition published London, 2011, 403 pp. Translated from the Spanish by Anne McLean. First published in Spain 2009.